Cytogenetic Analysis: The stemline chromosome number is hypotriploid and 11-12 marker chromosomes were common. Both double minutes and dicentrics were observed in 8% of each metaphase examined. The line is negative for CSAp (CSAp-) and colon antigen 3. This line has a mutation in codon 12 of the ras protooncogene, and can be used as a positive control for PCR assays of mutation in this codon. Propagation: ATCC complete growth medium: The base medium for this cell line is ATCC-formulated Leibovitz's L-15 Medium, Catalog No. 30-2008. 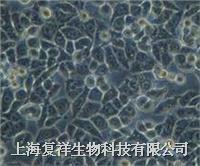 To make the complete growth medium, add the following components to the base medium: fetal bovine serum to a final concentration of 10%. Incubate cultures at 37°C. without CO2.